(WASHINGTON, D.C.) (October 28, 2016) Dr. Theodore P. Remley, Jr. addressed Washington, D.C. Campus and Online graduates at the October 28th commencement ceremony by impressing upon them the importance of hard work for achieving success. The Washington, D.C. Campus celebrated its fifth commencement ceremony with more than 115 graduates, many of whom were from The Chicago School’s Online Program. The Washington, D.C. Campus offers courses in 14 different psychology and behavioral programs, and concentrations. The Chicago School of Professional Psychology is one of the leading nonprofit graduate institutions dedicated to psychology and behavioral health sciences. Dr. Remley is a professor of counseling at Our Lady of Holy Cross College and has directed counselor institutes in Italy, Ireland, Bhutan, Buenos Aires and Malawi. A national certified counselor, he has served as a former executive director of the American Counseling Association (ACA), the world’s largest association exclusively representing professional counselors in various practice settings and is licensed as a professional counselor in several states. The Washington, D.C. Campus has had much to celebrate this year. Its Clinical Psy.D. Program received a seven-year accreditation from the American Psychology Association; the campus was awarded a $50,000 grant for Business Psychology faculty to provide consultation regarding implementation of the Workforce Innovation and Opportunity Act; and Dr. Catherine Roland, chair of its Clinical Mental Health Counseling Program, assumed the role of president of the ACA. Master of Arts in Forensic Psychology graduate Lindsay Keiser was chosen as student speaker, and also addressed her fellow graduates at the ceremony, while Dr. Tracy Dillinger (Chicago Campus Clinical Psy.D., 1994), manager of Safety Culture at NASA, was awarded the Distinguished Alumnus of the Year award. 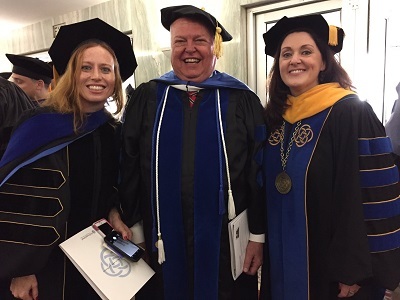 Pictured above from left to right: Dr. Heather Sheets, Dr. Ted Remley and Dr. Michele Nealon, president, The Chicago School. Founded in 1979, The Chicago School of Professional Psychology (TCSPP) is a nonprofit, private university devoted exclusively to psychology, and related behavioral health sciences. The Chicago School is an affiliate of TCS Education System, a nonprofit system of colleges advancing student success and community impact. The university serves nearly 4,300 students across campuses in Chicago; Southern California (Los Angeles and Irvine); and Washington, D.C., as well as through online programs. Our San Diego Campus will open in fall 2017.The Chicago School is accredited by the WASC Senior College and University Commission, (WSCUC), and its Clinical Psychology Doctoral programs in Chicago and Washington, D.C. are accredited by the American Psychological Association. With more than 20 graduate degree programs, thousands of hours of real-world training, and a wealth of international opportunities, TCSPP is the leader in professional psychology education. To learn more, visit www.thechicagoschool.edu.